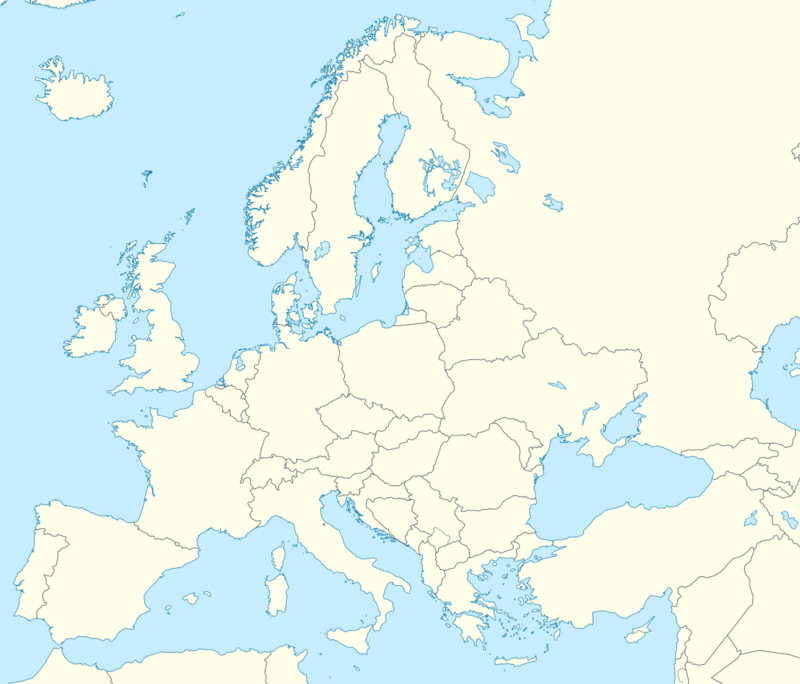 The term Solutrean comes from the type-site of "Cros du Charnier," dating to around 21,000 years ago and located at Solutré, in east-central France near Mâcon. The Rock of Solutré site was discovered in 1866 by the French geologist and paleontologist Henry Testot-Ferry. It is now preserved as the Parc archéologique et botanique de Solutré. The Solutrean may be seen as a transitory stage between the flint implements of the Mousterian and the bone implements of the Magdalenian epochs. Faunal finds include horse, reindeer, mammoth, cave lion, rhinoceros, bear and aurochs. Solutrean finds have been also made in the caves of Les Eyzies and Laugerie Haute, and in the Lower Beds of Creswell Crags in Derbyshire, England (Proto-Solutrean). The industry first appeared in what is now Spain, and disappears from the archaeological record around 17,000 BP. The Solutrean hypothesis builds on similarities between the Solutrean industry and the later Clovis culture / Clovis points of North America, and suggests that people with Solutrean tool-technology crossed the Ice Age Atlantic by moving along the pack ice edge, using survival skills similar to those of modern Eskimo people. The migrants arrived in northeastern North America and served as the donor culture for what eventually developed into Clovis tool-making technology. 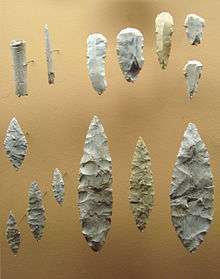 Archaeologists Dennis Stanford and Bruce Bradley suggest that the Clovis point derived from the points of the Solutrean culture of southern France (19,000 BP) through the Cactus Hill points of Virginia (16,000 BP) to the Clovis point. Stanford and Bradley also refer to other pre-Clovis finds in the Chesapeake Bay region of northeastern North America—such as the laurel-leaf Cinmar bifacial point—as possible links between Solutrean and Clovis lithic technology. The idea of a Clovis-Solutrean link remains controversial and does not enjoy wide acceptance. The hypothesis is challenged by large gaps in time between the Clovis and Solutrean eras, a lack of evidence of Solutrean seafaring, lack of specific Solutrean features and tools in Clovis technology, the difficulties of the route and other issues. In 2014, the autosomal DNA of a male infant from a 12,500-year-old deposit in Montana was sequenced. The DNA was taken from a skeleton referred to as Anzick-1. The skeleton was found in close association with several Clovis artifacts. Comparisons showed strong affinities with DNA from Siberian sites, and virtually ruled out any close affinity of Anzick-1 with European sources (see the "Solutrean hypothesis"). The DNA of the Anzick-1 sample showed strong affinities with sampled Native American populations, which indicated that the samples derive from an ancient population that lived in or near Siberia, the Upper Palaeolithic Mal'ta population. The Solutrean toolkit includes the world's earliest identifiable sewing needles. ↑ "Stone Age Columbus – programme summary". BBC. March 2004. Retrieved 2010-12-10. ↑ The North Atlantic ice-edge corridor: a possible Palaeolithic route to the New World. Bruce Bradley and Dennis Stanford. World Archaeology 2004 Vol. 36(4): 459 – 478. ↑ Straus, L.G. (April 2000). "Solutrean settlement of North America? A review of reality". American Antiquity. 65 (2): 219–226. doi:10.2307/2694056. ↑ Westley, Kieran and Justin Dix (2008). "The Solutrean Atlantic Hypothesis: A View from the Ocean". Journal of the North Atlantic. 1: 85–98. doi:10.3721/J080527. ↑ Rasmussen M, Anzick SL, et al. (2014). "The genome of a Late Pleistocene human from a Clovis burial site in western Montana". Nature. 506 (7487): 225–229. doi:10.1038/nature13025. PMID 24522598.